For me, Chattanooga has always been a place one passes through to get somewhere else, but I recently discovered this Southern city perched on the banks of the Tennessee River is a destination in itself. Maybe all those 1970s childhood road trips from Kentucky to Florida colored my view of Chattanooga. I remember it disappearing in the rearview mirror as my sister and I rattled along in the back of our parents’ “Brady Bunch”-like station wagon, calculating (inaccurately) how far Disney World was from Tennessee. I’m all grown up now, and so is Chattanooga. It has blossomed into a sophisticated city that embraces its past while looking to the future. Antebellum architecture, Civil War historic sites and decades-old attractions mingle with a beautiful, modern waterfront and a thriving arts scene. The Bluff View Art District is small, but flourishing, and I whiled away an afternoon strolling its streets, wondering how so much quaint charm could be contained in one city block. Perhaps it should be called the Bluff View Art and Artisans District, because half the fun is watching the neighborhood bread bakers, pasta makers, coffee roasters and chocolate makers at work. Art enthusiasts inevitably find their way to River Gallery, a Bluff View highlight. Located in a former residence that dates to the early 1900s, the gallery exhibits works by artists from around the globe. Each room is like a beautifully wrapped present you can’t wait to open. Intriguing paintings and sculptures, eccentric ceramics and intricate wood carvings are just a few of the treasures housed here. Equally compelling is the River Gallery Sculpture Garden, a two-acre outdoor exhibit space on the riverfront that features both a permanent collection and a temporary exhibit that changes annually. Visitors can view works by Leonard Baskin, Allan Houser, Ernest Trova and other art world luminaries. I felt like Alice in Wonderland as I walked beneath a towering scarlet flower and passed a butterfly the size of a pony. Of course, not all the flowers and butterflies are man-made. Deep pink azaleas bloom near a gazebo, and real butterflies occasionally alight gracefully on the sculptures, resting their fairy wings before fluttering toward verdant mountains that reach for a clear sky. In this enchanting garden, the beauty of art and nature unite in perfect harmony. 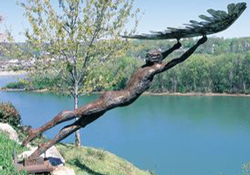 “Icarus,” a winged sculpture by Russell Whiting, seems poised to fly right off the river bank. I marveled that a work created from a medium as heavy as steel could appear so weightless and demonstrate such a fluidity of movement. I was so taken with the sculpture garden, I almost overlooked Bluff View’s main attraction, the Hunter Museum of American Art. It boasts the largest collection of American art in the Southeast, and exhibits works from the Colonial era to present day. A two-part facility consisting of a modern wing and a restored 1904 mansion houses the extensive collection, including works from the Ashcan and Hudson River Schools. This marketing strategy of turning barns into billboards was the brainchild of founder Garnet Carter, who opened Rock City in 1932. On Lookout Mountain, acres of natural beauty and heaps of over-the-top kitsch co-exist somewhat incongruously. But, once I got my head around the inherent weirdness of the place, I started to like it. The breathtaking panoramic view from Lover’s Leap stretches for miles, and that alone would have made it worth the trip, but there’s much more to see. I wandered through a maze of ancient geological formations with names like Needle’s Eye and Fat Man’s Squeeze, then marched bravely across the 180-foot-long Swing-A-Long Bridge, which crosses over a seemingly bottomless canyon. Fairyland Caverns, with its eerily illuminated gnomes and fairy tale characters, is one of the quirkier sights, a bit like putting plastic pink flamingos in the gardens at Versailles. But, bottom line: The place is fun. Had my family’s station wagon stopped there in the ’70s, I would have been mesmerized. On the other side of Lookout Mountain is Ruby Falls, another iconic attraction, which has been around since 1930. I stepped inside an elevator that plunged 260 feet through layers of limestone for a guided cave tour that concluded with a thundering, 145-foot-tall waterfall — a spectacular ending to my Chattanooga visit. Bluff View Inn. 411 E. Second St., Chattanooga. 423-265-5033. Tony’s Pasta Shop & Trattoria, 212 High St., Chattanooga. 423-265-5033. Hunter Museum of American Art. “Seeking the Spiritual: The Visionary Art of Elliott Daingerfield” opens Dec. 4. 10 Bluff View Ave., Chattanooga. 423-267-0968. Rock City. 1400 Patten Road, Lookout Mountain. 1-800-854-0675. Ruby Falls. 1720 S. Scenic Highway, Chattanooga. 423-821-2544.